The plenary session of the Pontifical Council for Promoting Christian Unity was held in Rome on 18–21 November on the theme “The goal of ecumenism: principles. opportunities, and challenges fifty years after Unitatis redintegratio”. 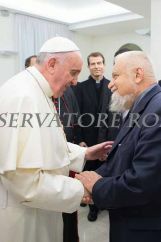 As consulter of the Pontifical Council, br Enzo participated in its work. During the plenary session the present situation of the principal dialogues of the Catholic Church with other Churches was presented and discussed., with emphasis on the central questions and on problems that need to be resolved. The plenary session began with a eucharistic celebration in St Peter’s Basilica on Tuesday, 18 November. A commemoration of the 50th anniversary of the promulgation of Unitatis redintegratio, the Decree of Vatican Council II on ecumenism, on 21 November concluded the plenary session. The commemoration had tow parts. "I address you directly… the prepared talk you will read later. Ecumenism is a road, a road to be taken together, not only an expectation. Let us not wait until the theologians agree, then be together, we should already now take the road together. A road in prayer, in humility, in communion of blood shed for Christ today, today. When a Christian is killed, he is not told, because you are a Catholic, because you are a Lutheran, or because you are an Orthodox, but because you are a Christian. There are new obstacles to ecumenism… but courage! And thank you for what you do as a service to the Church for the unity of all Christians". In the evening of that day vespers were celebrated in the basilica of St Paul outside the Walls, and on Friday morning, 21 November, there was a public session at the Pontifical Gregorian University.